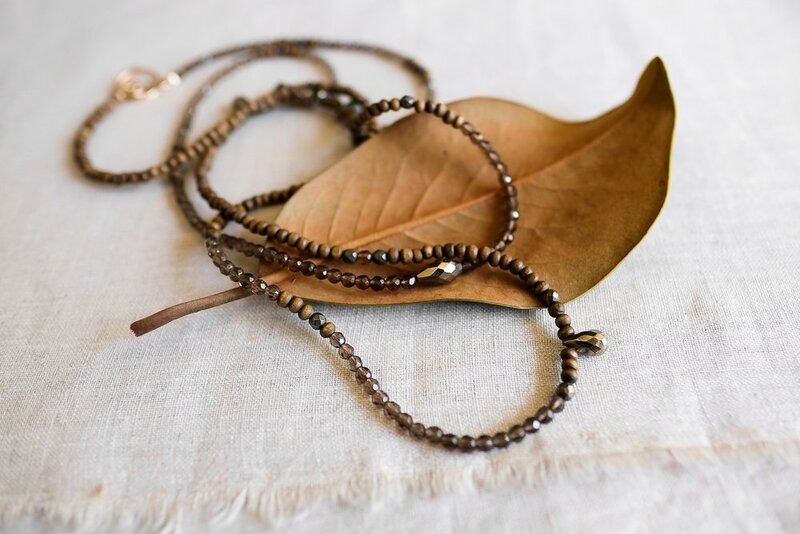 Due to it’s handcrafted nature and inclusion of organic materials, Search Enclosed jewelry is delicate and should be handled with care. The following are some helpful tips to ensure the beauty and longevity of your pieces. avoid contact with perfume, lotion, hairspray and makeup as these can cause corrosion and tarnish. Always put jewelry on after applying beauty products. Similarly, exposure to chlorine and salt water should be avoided. Please do not swim while wearing your jewelry. To keep you and your jewelry safe, it is best to remove it prior to any type of physical or strenuous activity. With raw metal components, it is normal to see some natural oxidation with time and wear. Regular attention and cleaning will keep jewelry looking it’s best. When removing your jewelry, wipe with a soft cloth to prevent dirt and residue buildup. To minimize tarnish, it is best practice to store jewelry in an airtight bag away from direct sunlight. When a more thorough cleaning is needed, we recommend using an old toothbrush with warm water and a drop of phosphate-free dish soap. Pat dry. A soft polishing cloth or gentle silver polish can be used to remove any remaining tarnish. We hope that you will enjoy wearing your Search Enclosed jewelry for many years to come. In the unfortunate event that damage occurs, we are happy to offer the following repair services. repair services are complimentary on pieces purchased directly through search enclosed. REPAIRS are SUBJECT TO A SMALL Labor FEE ASSESSED ON A CASE-BY-CASE BASIS. Repairs for jewelry purchased through third party retailers fall in this category. Please be aware that in extreme circumstances some damage may be beyond repair. photos may be requested in order to determine whether a repair can be accommodated. An Additional materials fee will apply if substantial components (beads, stones, chains, etc) are lost or damaged beyond recovery. all associated shipping charges are the responsibility of the customer.